I love pork pies. Those fatty, dense slabs of pastry and meat - it's the kind of food that could only really come from Britain. I also love apple pie. And since we all know that pork goes with apple, why not combine the two dishes? But I'm not talking about a simple pork and apple pie. Oh no. 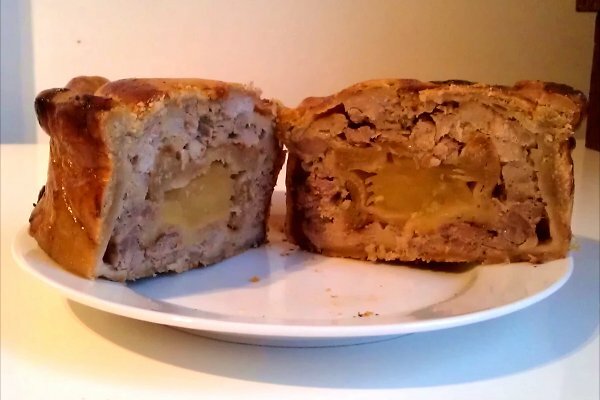 I mean a pork pie with a whole apple pie inside it. 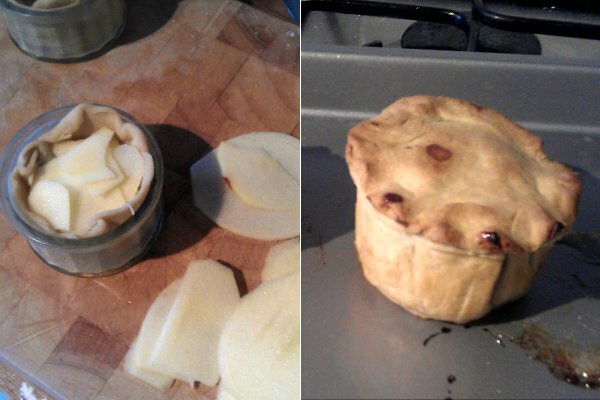 Making a pie within a pie has long been an ambition of mine, even though I'm not really much of a baker. But after I came up with this concept, I just had to give it a try. 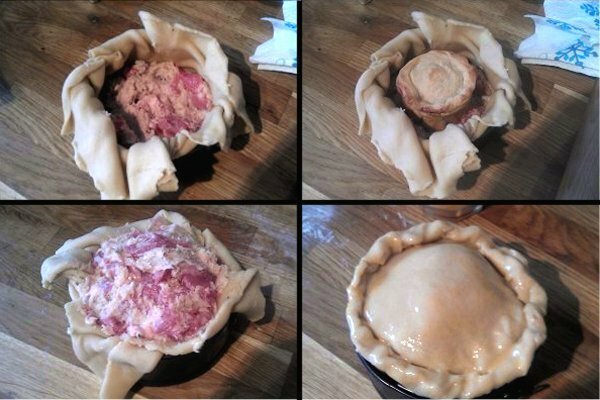 Pork pies are made from something called hot water crust pastry, which is made from water boiled up with lard or butter (I used both), then combined with flour. It's really pretty easy to make, and requires almost no stirring. You just pour the hot liquid into a well in the flour, and it all just sort of magically combines with a minimum of persuasion. I made the apple pie in a small ramekin, using lots of thin layers of apple, and just a little bit of sugar. I rolled the pastry as thinly as I could without breaking it. 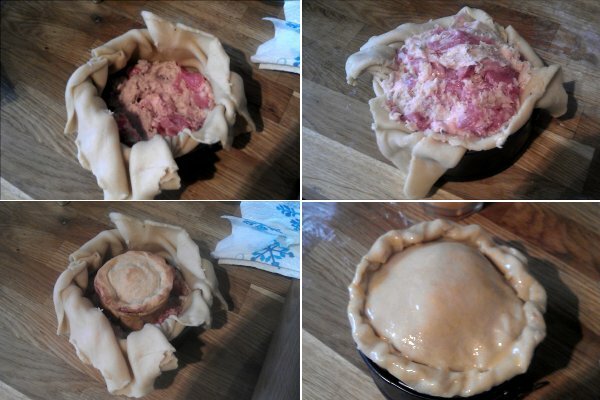 Next I prepared the filling for the pork pie. Sausage meat, chopped pork shoulder, sage, onion, a drop of oil, and salt & pepper. 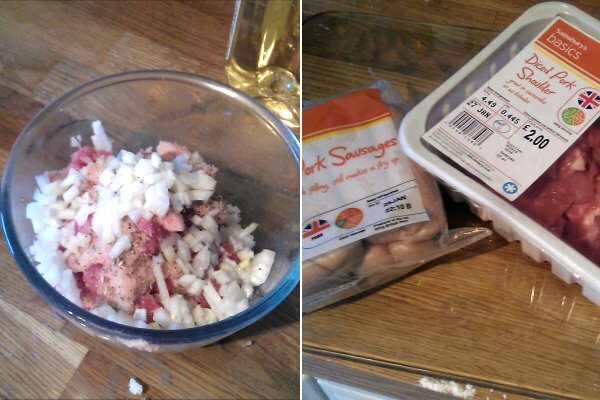 I use the term "sausage meat" - I'm not sure how much actual meat these sausages contain. "Grey sludge" might be a more appropriate description. But it's really just there to plug the gaps between the shoulder meat, thus ensuring maximum density. Once the inner pie had cooled, it was time to start assembling this monster. You're supposed to make these free-standing, but that sounds way too hard, so I used a small cake tin. I put a layer of pork at the bottom of the pie, then put the apple pie in the middle, and surrounded it with as much pork mixture as I could cram in. I put the lid on the pie and crimped the edges, and brushed it with egg. These things take a LONG time to cook. After half an hour on a high heat, I removed the pie from the tin, and cooked it at a lower heat for another hour before it was ready. The finished pie was delicious, and well worth the wait. 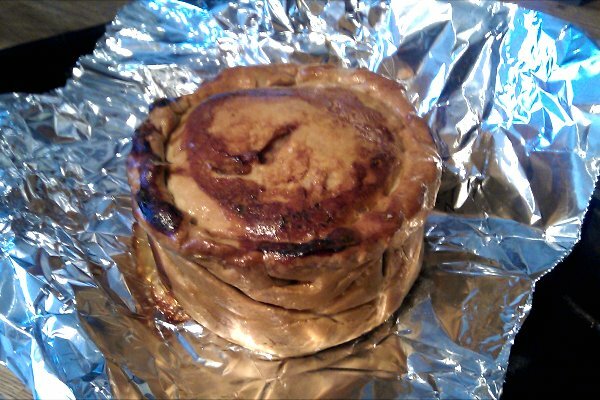 The pastry of the inner pie was a little undercooked, but it tasted great anyway! Shame about the undercooked pastry of the inner pie. In Cornwall last year I had a pasty that was apple at one end (apx a quarter of the pasty) and meat & potato at the other. Delicious. 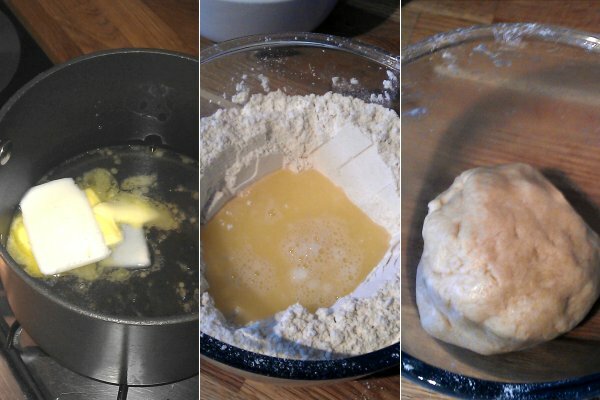 Noodles - yeah, this pastry takes bloody ages to cook. Still, didn't spoil my enjoyment. I think mkII will include a cider jelly.